Magaluf is also known as Magalluf. It is an exotic holiday spot in Spain which has been popular for many years. Tourists from all around the world visit this place for the beaches and nightlife that it offers. Mostly, British and Scandinavian tourists visit this place. But, people from all around the world make some regular visits to this part of Spain. Magaluf is situated in the town of Palma Nova and Torrenova. It is included in the Calvia municipality district. Majorca is the nearest airport to the place which is just 25 kilometer away. Connecting taxis or cabs can be hired to Magaluf once you reach Majorca. Even bus services are quite frequent on this route. Magaluf gives you a very wide choice of hotels and places to stay. It also has many beautiful as well as economical apartments which you may rent during your visit to this place. Magaluf is a place that provides an option for budget holidays. It is quite popular among people who want to plan a trip with their family, visit a beautiful destination and do not spend much. Magaluf gives you an option to plan such economical trips. You can look for some good deals on the Internet. There are many tour operators who give heavy discounts and some good deals when you book a trip to Magaluf through them. Magaluf combines beauty with a fast paced nightlife. This makes sure that all the members of your family enjoy the place to the maximum extent, irrespective of their ages. 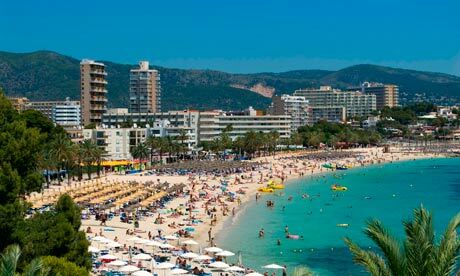 Located near Majorca, Magaluf is one of the most famous and popular tourist spots besides Palma Nova, Santa Ponsa, Callo Miller and Alcudia. Magaluf is a place for everyone. People from all age groups can visit this place and enjoy a lot. In fact, this place is like a heaven for single stag travellers. Most of the people aged around twenty five years visit this place to enjoy a fun weekend. This place offers a variety of options for people from all age groups. But, this is place is very special because of fast paced nightlife, clubs and restaurants. Though this beach is not very long, clubbing and nightlife usually make up for it. Besides clubs and restaurants, Magaluf offers various different places which you can visit on a holiday. There are two water parks equipped with high tech technology and fun games. People visit them for scuba diving, snorkelling, jet skiing, bungee jumping and cart racing. The Black Lizard island is also popular among tourists. As the name suggest, a lot of black lizards can be easily seen all around this island. This island is just four hundred meters from the beach front. People going for holidays to Magaluf usually visit this place for its nightlife. Most of the people visiting this place are usually young adults who come here to spend a weekend. Besides clubbing all night, you can even enjoy a good meal in classy Magaluf restaurants. Moreover, you can also enjoy some of the world class Djs who regularly perform in some of the clubs in Magaluf.